Posted on April 26, 2017 , in Swim Spas. A swim spa provides you with many options for fun, fitness, and relaxation, but by adding plants and trees to the area, you can create a breathtaking backyard oasis. 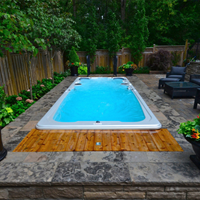 Below you’ll learn expert landscaping tips that will help you beautify your swim spa area. There is no better way to add natural beauty to your swim spa area than by including plants. They can add character, energy, and privacy. They are also easy to relocate, so you can try out several arrangements before deciding what works best for your outdoor space. If you’re on a strict budget, installing planters can reduce the square footage of your patio and save you money while adding striking focal points around your swim spa. If you want to create a quiet, enclosed area, consider placing pots near each other or add trees for more coverage. No matter where you live, you likely have many regional plant options that are right for the weather and landscape of your area. Some good choices that are easy to care for include evergreens and ornamental grasses. In addition, long-blooming flowers like zinnias, begonias, and hydrangeas will bring brightness to the area for long periods of time. One tip to keep in mind is that you’ll need to water outdoor plants much more often during hot summer months to keep them vibrant and healthy. Just as there are some plants that are ideal for your swim spa area, there are others that can cause problems. Fruit trees can be extremely messy and involve a lot of cleanup. If you don’t want bees and other insects in your swim spa area, don’t plant trees, herbs, or plants that will attract them. It’s also a good idea to steer clear of any plants that have thorns or barbs that can cause injuries. Finally, if you want the area and your swim spa to stay debris-free, avoid deciduous trees, crepe myrtles, and grass. One of the best ways to create a mood for your outdoor space is by using outdoor lighting. For example, soft lighting can make the area feel more intimate. By purchasing an outdoor lighting kit, you can usually install lighting on your own without much hassle. If you’re installing a new swim spa but aren’t ready to add lighting, having your electrician run an electrical line to the area during installation can save you money when you add lighting in the future. Now that you have a clearer sense of how to create a gorgeous landscape around your swim spa, download our buyer’s guide and find the perfect swim spa for your style.